Get all the news in the print edition of the News! Available at local newsstands or by subscription. Check current legal notices and upcoming events here. 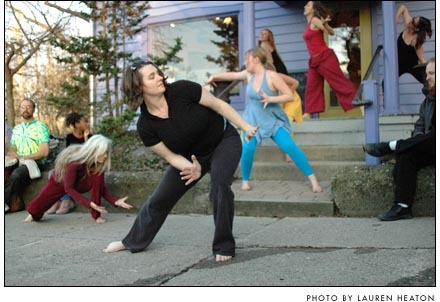 Emily Elliot took a turn out in front of the Yellow Springs Dance Improv performance on the steps of the Winds Wine Cellar last Friday night, which opened the Yellow Springs Arts Council’s March Third Friday Fling event. Phillip Bottelier led a drumming group in the background, and the event continued in the 360° Studio Theater with hoop dancing by Soul Fire Tribe, a ribbon dance, Melissa Heston’s original work, “Bon Voyage,” and an improvisation by Heston, Ali Thomas and Marybeth Wolf that drew belly laughs. At their meeting on Monday, March 15, Village Council members approved 5–0 the first reading of the Village budget for 2010. After three budget workshops on Feb. 9 and 23 and March 6, Council agreed on a total budget of $13,553,490 for 2010, including $3,671,167 allocated for the general fund; $1,616,810 for the special revenues fund; $126,353 for the debt services fund; $520,500 for the capitol projects fund; and $7,618,660 for the enterprise funds. Every year the local blues fest reminds community members about the roots of contemporary popular music. If gospel can spawn the blues, jazz, reggae and rap, then what can the art of the local community tell us about our own history and roots? African American Cross-Cultural Works and the Tecumseh Land Trust aim to find out when they put on the first ever Roots Fest on Saturday, March 27, at Bryan Community Center. It will be an evening of performances in which villagers use the arts to connect to and share their own stories.